One often hears the phrase "unfunded mandates" when discussing the economics of public schools. This is a disparaging term, meant to criticize an action taken by the government - usually the State government - to impose new requirements on a school district, but not providing the funding for implementation. When drawn into such a discussion, my suggestion to folks is that they're concentrating on the wrong word. Most folks think it's the unfunded part which is the problem. I think it's the mandate which is the root problem. Here's what I mean. One of the most recent examples of this was the requirement enacted in 2009 by the Governor Ted Strickland and the 128th General Assembly that all public school districts implement all-day kindergarten. We can consider 640 kids in school for half-days to be the same as 320 kids in school all day. With an average classroom size of 23.43 for kindergarten (as of the Oct 2011 enrollment data), 320 kids would require 27 teachers. Those teachers would each have 23 kids for the morning, and a different set of 23 kids in the afternoon. To have these same 640 kids in all-day kindergarten, we would have to double the number of teachers, from 27 to 54. While our average classroom teacher salary is $69,369, according to the 2010 CUPP report from the Ohio Dept of Education (plus 34% for taxes and benefits, or $90,000/yr total cost), if we were to hire 27 new kindergarten teachers, most if not all of them would be at the low end of the pay scale, around $45,000/yr. With benefits, the cost would be about $60,000/yr for each new teacher, or $1.2 million/yr. The Dispatch story says our cost would be about $1.7 million/yr. I can accept this number, as in addition to these new teachers, we would have the cost of 27 new classrooms, probably in the form of leased 'modulars' that we'd have to park at every elementary school. And so the cost of this "unfunded mandate" was seen to be $1.7 million/yr, because the State was telling us we had to do it, but wasn't backing it up with any new money. Turns out it's a bit more complex than that. For decades, the State funding model has used the number of students in a school district as the primary basis for determining the amount of State funding that would be granted. Actually the number used is called "Average Daily Membership," or ADM, and it is close to the number of students, but with some adjustments. For example, kids with disabilities are counted as a little more than one student, depending on the severity of disability. In this way, the State helps underwrite the greater costs of serving students with special needs. In the case of kindergarten, each kid is counted as one-half student, reflecting the assumption that these kids would be in school for only a half-day, therefore creating half the cost burden of an all-day kid. So with the mandate that all school districts be required to offer all-day kindergarten to all kids, the State did indeed create a funding stream to help support the mandate by simply allowing school districts to count kindergarten kids as a whole kid, rather than a half. This doubles the amount of State funding granted to a district for kindergarten. Does that sound unfunded to you? But here's the catch: for districts like ours, as well as most suburban districts in Ohio, the funding models had a mechanism called the "Transitional Guarantee," which was created to ensure that in the transition from one funding model to the next, no school district would see a dramatic reduction in its State funding. This guarantee existed in Ted Strickland's Evidence Based Model, and it existed in the model before that (to smooth the transition from whatever was before that model). One could say that the funding model used by Gov. Kasich and the 129th General Assy was nothing but a transitional guarantee approach - allocating new funding based on prior funding and not worrying so much about all the components of the prior two funding models. For districts 'on the guarantee,' this change in the counting of kindergarten kids wouldn't have much impact on State funding. So from a practical standpoint, the requirement to implement all-day kindergarten would be unfunded for us - meaning we would have to bear the full incremental cost locally. That's the reason the School Board has opted to request waivers from this mandate each year. Fortunately, subsequent to the passage of the last budget bill by the 129th General Assembly, all-day kindergarten is no longer a requirement. However, this still isn't quite the full story. We have to step back and ask "where does the State of Ohio get the money it passes out in the form of State funding to school districts?" Of course the answer is that most of it comes from us. According the Budget submitted by Gov Kasich, 80% of all State revenue (excluding that associated with the pass-through of Federal subsidy for programs such as Medicaid) comes from individual income taxes and sales taxes. According to the CUPP report, the our school system gets back 41 cents for each dollar of State income taxes paid by the people of our community. One could say that this means that to get back $1.7 million per year from the State to fund all-day kindergarten, our State income taxes would have increase by $4 million. So if we were mandated to implement all-day kindergarten, wouldn't it be better to fund it with a local tax that raises $1.7 million/yr (about 0.7 mills), than to be taxed $4 million more by the State? Of course I'm oversimplifying things. Funding new things doesn't always have to mean more taxes. In these tough times especially, spending has to be prioritized, and that often means that new programs have to be funded by discontinuing other programs. But the purpose of this article is to point out that often the most efficient way for communities like ours to fund new mandates is with local taxes. The real fight needs to be over whether the mandate should be enacted in the first place. If we want to have all-day kindergarten in Hilliard schools, let the people of our community make that choice, and back it up with local funding. Nor do we want the State to be telling other school districts that they must have all-day kindergarten, and then funding it with our income tax and sales tax dollars. 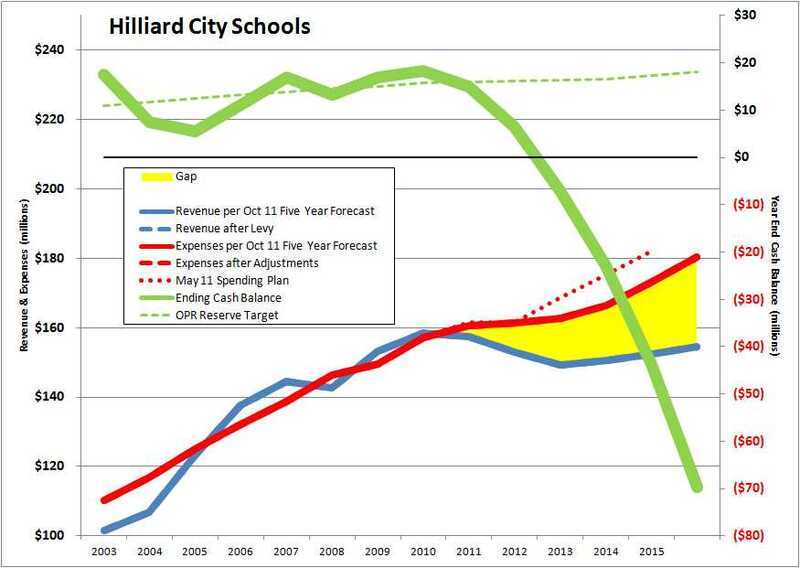 The yellow area in the chart represents the gap between spending and funding. By state law, the District cannot operate without cash reserves, nor can these forecasts - which must be submitted each May and October to the State Board of Education - show anticipated revenue from levies that haven't been passed. That means that we cannot in fact operate the district past FY12 (this year) without less spending than shown in this forecast, more revenue, or both. That's the reason we have a levy on the ballot. 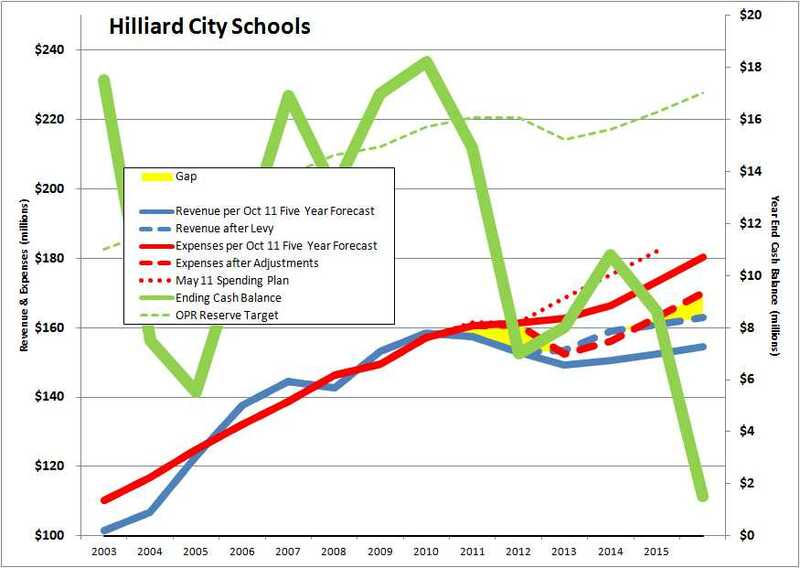 Now the yellow area - the revenue/spending gap - is smaller, but still there. That again means we need to have less spending, more revenue, or both. 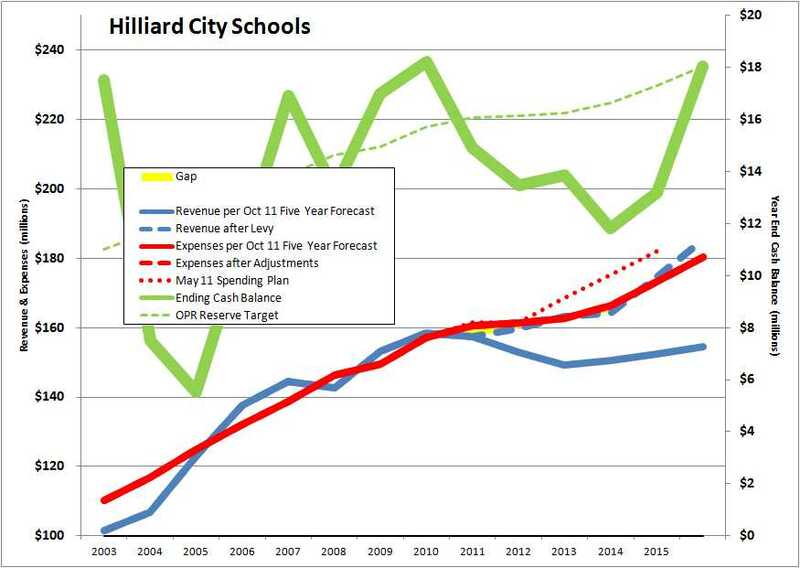 Let's say that the spending is left as Mr. Wilson projected; what size future levy is needed to close the gap? 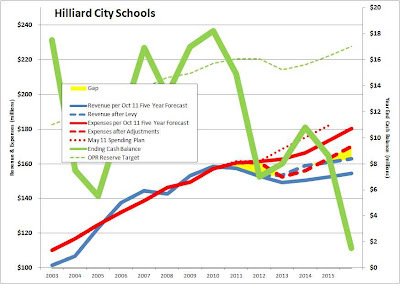 Back in April, I wrote an article in which I described the four primary knobs we can turn in the budgeting process: 1) the rate of spending growth; 2) the interval to the next levy; 3) the size of the next levy; and, 4) the size of the "rainy day fund" we want to keep. So let's say the 5.9 mill levy passes. The Board has committed that it will be at least 3 years before another levy is proposed. Board policy is that the rainy day fund should be kept at about 10% of annual spending, and the Audit & Accountability Committee has recommended that we restore this level of reserves as well. The spending plan in this forecast is a little unusual. In their current contract, the teachers have been offered an early retirement incentive package that the Administration forecasts will be accepted by 75% of those eligible. 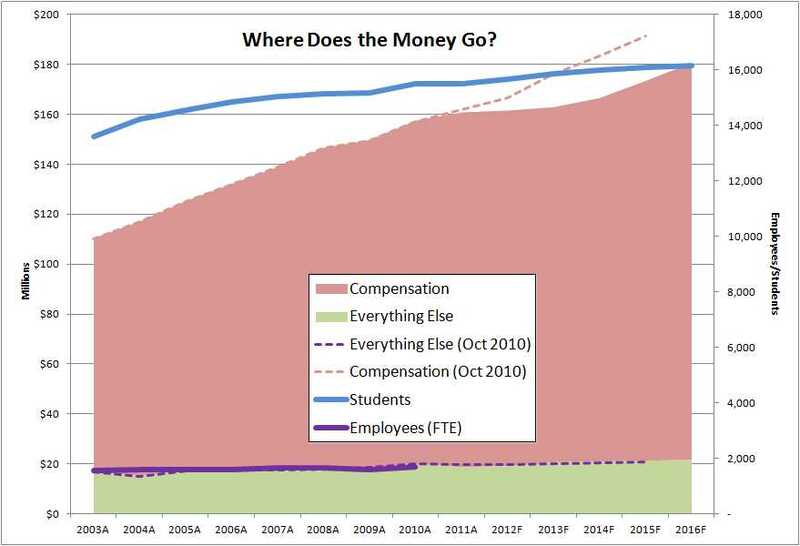 Combined with the three year base pay freeze, and the postponement of step increases until 2013, this actually makes our compensation expense go down in FY13. However in FY14 spending is forecasted to rise 2.3%, and then 4.1% in both FY15 and FY16 (it was 4.8% in the years FY03-FY09). So what if we lower the rate of spending growth? Note that projected spending has already been reduced compared to the May 2011 Five Year Forecast (the dotted red line). No, I'm not getting caught in the semantics of claiming that there has been a spending cut because one forecast projects less future spending than the last forecast did. There has not been, nor is there projected to be, any year in which the total spending is less than the year before. Nor am I at this time advocating spending cuts, although that will certainly happen if this levy doesn't pass. As has been long clear to readers of this blog, 88% of our spending is for compensation and benefits. Our spending for compensation and benefits increases faster than the rate of student growth, and it increases faster than the rate of employee (FTE) growth. In other words, the average cost per employee for compensation and benefits is going up. As you can see in the chart above, that growth rate has been substantially reduced compared to the Five Year Forecast published one year ago (the dotted line). That's because of the projected effects of the early retirement incentive program, and the very real effects of the base pay freeze and accompanying step delays (one step will be eliminated altogether). However, this is being offset by the increasing cost of benefits, in particular health insurance. Even though the teachers and support staff have agreed to pay 15% of the health insurance premiums (it was 10% in the prior contract, and before 2008 was 0%), the total new dollars we'll spend over the next five years on health coverage will be $6 million more than we spend on increased compensation. Some advocate demanding that the teacher take pay cuts. I don't. That might have to be put on the table if things get really bad, but we're not there yet, in my opinion. The thing that could really nail us is having the State of Ohio further reduce our state funding. We cannot continue to ask the people and businesses of our community to keep filling the deepening hole created by a bad economy. If there are significant further reductions in state funding, pay cuts might have to become part of the solution to keeping our district solvent. There are no easy answers. We'll all have to participate in finding solutions. I hope this article helps inform the conversation. At M's request, here are a couple of additional charts. To make the interval following a 2012 levy at least three years, the 2012 levy would need to be on the order of 5.5 mills. There are an infinite number of permutations we could explore. but the point remains the same: there are four knobs to twist, pick three and you get the fourth. There is no right answer. Some people in our community want the Board to spend less, whether that be cuts to academic and extracurricular programming (which reduces staffing needs), or by pay cuts, or both. Others are concerned that we might not be spending enough - that we are depriving the kids of opportunities by not spending more. There is no majority position, only a spectrum of individual opinions. That's the way democracy works. Candidates run for office, and issues are put on the ballot. The winners get to choose how things go until the next election. If folks with extreme positions are elected, we tend to get legislation that brings extreme changes. SB5 is the current right-wing example. But we've already forgotten that not so many years ago, the left-wing prevailed, and we got all kinds of legislation that tipped the laws in favor of their views. This whip-sawing can't be good for Hilliard, for Ohio, or for America. We have to again learn how to communicate (listening is at least as important as talking), negotiate, and live with compromise. I read a number of education-oriented publications and blogs, but have rarely come across articles that I thought would be of much interest to folks who come here. But this one by Rick Hess in the EdWeek blog made a point worth passing on. I haven't seen the movie Moneyball, but I understand the premise. Baseball is as much a playground for numbers geeks as it is for athletes. All kinds of statistics are kept, reported, and memorized by the most left-brained of baseball fans. The storyline in Moneyball is that one particular numbers geek suggests to a major league manager that the statistics that get all the attention, like batting average, home runs, and RBIs, are perhaps not the ones that are good predictors of future success in winning games. So he proposes using a different set of statistics to predict which players would be most valuable to the team, and how they should best be utilized. Hess suggests that the growing infatuation with value-added measures and test scores might lead to the same kind of misguided assessment of effectiveness as do the high-visibility statistics in baseball. He's suggesting that in the effort to develop effective measurement systems for education system performance - whether we're talking kids, teachers, or schools - we need to accept that this kind of statistical analysis in the education domain is still in its infancy, and that we have a way to go before this body of research evolves to really meaningful statistics, like the ones the numbers geek derived in Moneyball. Lots of folks would like to use the standardized test scores and other existing measures to determine all kinds of very important stuff, in particular the allocation of resources and the evaluation of teachers. SB5, if it withstands the repeal initiative, mandates merit-based evaluation of teachers, but conveniently doesn't say how it should be done. Most teachers I've talked to don't have a problem with the theory of a merit-based system, they just don't trust that it will be administered fairly. Hess's article points out another potential flaw - using the wrong statistics to measure effectiveness. I spent my career in cahoots with some pretty tremendous sales folks. One of the main challenges of my colleague, the Sales VP, was to come up with an annual commission plan for his sales team that motivated them to sell the right set of products for the right set of terms so as to meet the strategic goals of the company. The sales folks - as smart as they were - would most assuredly figure out how to maximize their compensation given whatever rules the Sales VP set, regardless of whether or not their efforts contributed to meeting the company's strategic goals. So the Sales VP had to put a great deal of thought into how to design the plan to get the behavior and results he was looking for. We have to take the same kind of care if and when a merit-based system is put into use to determine teacher compensation. Otherwise there will be some unintended and expensive consequences, and we still might not achieve our strategic goals. The Columbus Dispatch today published a story titled "Is SB5 good for Ohio?" SB5 = Senate Bill 5, the law whose fate is being determined by referendum (Issue 2) on the November ballot. The story addressed a number of topics, including an often misunderstood concept regarding pension plan contributions called "pickup." Unfortunately, the Dispatch didn't quite get it right. The first point to understand is that the teachers' pension program is not operated by our school district, but rather by a quasi-State agency called the State Teachers Retirement System (STRS). STRS was created by State law, and the State retains a certain amount of control over its operations. But the primary governance of STRS is handled by a Retirement Board, made up of five elected contributing teacher members; two elected retired teacher members; an investment expert appointed by the governor; an investment expert appointed jointly by the speaker of the House and the Senate president; an investment expert designated by the treasurer of state; and the superintendent of public instruction (ie the State Superintendent) or his designated investment expert. The STRS pension fund gets its money primarily from contributions made by working teachers and by the school districts which employ them. The maximum contribution rates are set in the law, but may be set to lower numbers if the Retirement Board feels the fund can be kept solvent with smaller contributions (STRS is not solvent, by the way). Currently, the Retirement Board has the contributions rates set to the maximum amounts allowable by law: 10% of the teacher's salary paid by the teacher, and another 14% of the teachers salary paid by the school district. Article 32 of the Collective Bargaining Agreement between the Hilliard Education Association (HEA, the teachers' union) addresses retirement system contributions. In this article, you see the use of the word "pickup," and it has confused many people over the years, including me. While the language of Article 32 is accurate, if you don't know that "pickup" is a code word in the world of public employee retirement systems, it's easy to misinterpret this section. Here's what "pickup" means in the context of our contact with the HEA. It DOES NOT mean that the school district (ie we the taxpayers), is paying both the 14% employer and the 10% employee shares. Rather, it is a mechanism which allows the teachers to make their share of the retirement contribution with pre-tax dollars, in a method no different than that used by those in the private sector to contribute to 401(k) plans with pre-tax dollars. Let's assume that the teacher has 10 years of experience and a Master's degree. According to the pay scale in their Collective Bargaining Agreement, this teacher would have a Base Pay of $64,525. Let's make it $65,000 just to use round numbers. The employer's share of the contribution to STRS is 14%, or $9,100. The teacher's share is 10%, or $6,500. This is deducted from the $65,000 base pay, reducing the take home by $6,500. However, for purposes of the W-2, the teacher's gross salary is reported as $58,500. This is what makes it a "pre-tax" contribution. STRS recognizes the whole $65,000 for purposes of calculating pension benefits. The administrator's share is 10%, or $9,000, but this is paid by the District. This extra 10% is treated as income as well, increasing the total employer contribution to 14% of $99,000, or $13,860, and the 10% employee contribution to $9,900. This means $23,760 in total is paid to STRS, all by the school district. The administrator has no money deducted from the $90,000 base pay for retirement contributions. For purposes of calculating pension benefits, the administrator's salary is reported as $99,000. I hope this helps straighten out what goes on with retirement plan contributions in our school district. Please let me know if you have any questions. By the way, the teachers and administrators do not participate in Social Security, neither making contributions, nor getting any benefits. First, I absolutely agree with your economic analysis, and would extend it to say that our goverments have made unfulfillable promises to not only employees, but to the people of the country as well. It's going to take rare leadership and even more rare 'followship' for us to restore economic stability to our country. I'm reminded of a poster I once had which said "Lead, Follow, or Get Out of the Way!" There is no one description that fits everyone in our community. Some are elderly, barely getting by, and having to make choices between utility bills, taxes and medicine. Some live in million dollar homes, and their tax bills are insignificant to them. More than half the households in our district have no school age children. Others live in extended households with many school age children. Increasingly there are families who were doing okay when both parents were secure in their jobs, but are now struggling after one or both of the parents have lost a job and remain unemployed. There are as many foreclosures in wealthy neighborhoods as in those of more modest incomes. It doesn't matter whether an organization exists in the public or private sector - when revenue takes a dive, survival is threatened. It is crucial for the leadership to ascertain whether the situation is temporary, and can be weathered with temporary measures (e.g. spending down cash reserves), or whether a structural change has taken place, demanding commensurate structural change in the enterprise. The American auto industry got this exactly wrong. They thought the "oil crisis" of the 1970s was a temporary situation, and that they could keep selling huge, expensive, unreliable gas-guzzlers once the oil situation resolved. Both management and labor misjudged the situation, creating an opportunity for the Japanese automakers to go from a tiny piece of the market to being the market leaders. Only after near collapse did the American management create world-class products, and the labor unions agree to comp structures which allow for competitive pricing. Excluding the banking industry, which is still very much screwed up, American businesses have either been successful in restructuring to our 'new normal,' or they've gone out of business. It's been gut-wrenchingly painful, and the pain likely isn't over, but those who have taken the steps necessary to survive so far have a fighting chance. It's time that the public sector face up to this situation as well. As citizens, and consumers of government services, we may need to be willing to accept a diminished level of service. The Post Office is likely to drop Saturday delivery. I think that would be a good move. I think they should raise the price of stamps as well - especially for junk mail, which is easily 90% of the mail we receive at our house. Are there other government agencies doing stuff we can live with less of, or without, so we can preserve those few things which are truly essential? And just like the auto industry, we need to have a tough conversation about the number of people we employ in the public sector, and what they receive in compensation and benefits. Senate Bill 5 is a spectacularly clumsy way to start the dialog, but that doesn't mean the conversation isn't needed. Whichever way the vote on SB5 goes in November, we still need to have an honest, empathetic, and solution-oriented conversation with the public sector unions about how to align their expectations for comp/benefits with the capacity and willingness of the public to pay the taxes necessary to support those expectations. We haven't yet had that conversation in our school district. Most people - whether taxpayer or district employee - don't even understand the issues. So the discussion remains mostly on an emotional level, and that's what this levy vote is going to be as well. With the teachers and staff freezing their base comp through 2013, steps through 2012, and increasing their health insurance contribution to 15% starting this year - had the State of Ohio not reduced our funding by $10m/yr (FY13 vs FY09), then we could have funded the district at our current spending level for three more years with a 2 mill levy, by my calculations. But with the deep State funding cuts, it's going to take the 5.9 mills we have on the ballot to keeps things as they are. Few folks understand this situation. If this levy is defeated, we have to take $10m/yr out of the spending plan. That's not optional - we have insufficient cash reserves to just hold on until the next State budget and see how that one looks for us. So the Administration recommended, and the Board approved unanimously, a list of cuts which will take place if the levy fails. None of us on the Board want to see that happen, which is the reason I support this levy. Some in our community are angry about this cut list. They feel the community - and our kids - have been taken hostage, and the 5.9 mills is the ransom payment. That's it not so much a 'cut list' as it is a 'threat list.' I understand that. It does feel that way if you don't understand the economics. But if 90% of our costs are determined by how many folks we employ and how much we pay them, and if the 'how much we pay them' is set by collective bargaining agreements, then the only option available to the Board when spending must be reduced is to reduce the number of folks we employ. That results in a cut list exactly like what has been presented. 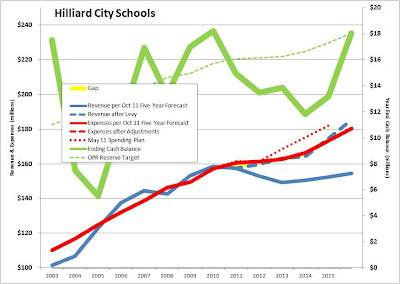 There are some in our community who feel the $10m/yr spending reduction can be achieved by having the teachers, staff and administrators take pay cuts. With ~1700 FTEs, that would be base pay cuts averaging $4,700 (+ 25% benefits), or 7.3%. Interestingly, this is the same percentage increase one gets with a 3% base pay increase and a 4.15% step increase (compounded), which were the terms of the 2008-2010 HEA contract. I am not advocating pay cuts at this time, but respect the reasoning of those who are. At least they understand the math. So I go back to the point that we need to have a reasoned and empathetic conversation with all the stakeholders - parents, non-parents, business owners, and employees - and figure out a long term strategy for funding our schools. It can't be a static strategy - it looks like the Statehouse is going to swing to extremes from election to election for the foreseeable future. But there has to be some thought put into a few different scenarios so the people of the community and the employees know to expect X if Y happens. We're not going to have that conversation until more folks understand the problem in economic terms, not just with their emotions.